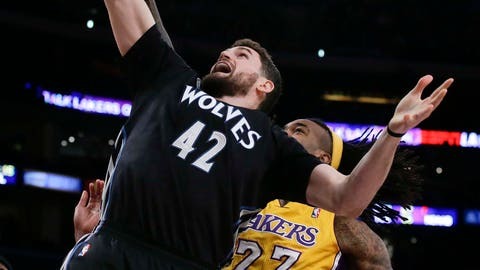 Minnesota Timberwolves forward Kevin Love pulls a rebound away from Los Angeles Lakers center Jordan Hill. Notes: Henry was the 12th overall pick in the 2012 draft, by Memphis. His older brother C.J. was the 17th overall pick in the 2005 baseball draft, by the Yankees. . . . 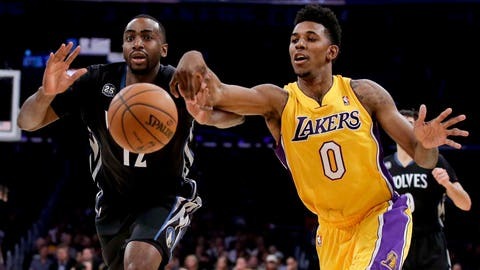 This is the first time since moving from Minneapolis to Los Angeles that the Lakers have failed to go more than a game over .500 through their first 26 games in back-to-back seasons. . . . Love has fouled out only once in 313 NBA games. It was against the Lakers on Jan. 30, 2009 — as a reserve — in a 132-119 loss at Minnesota.